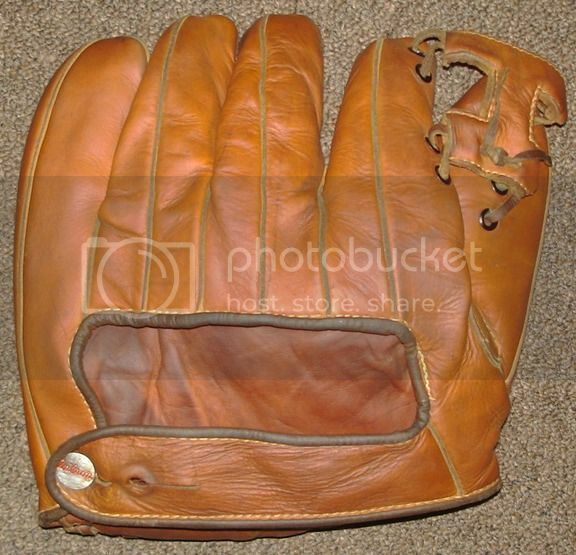 A NOS Reach model 32 catchers mitt with hang tag sold for $250. Last edited by mikesglove on July 4th, 2014, 1:41 pm, edited 1 time in total. A circa 1950 NOS Wilson "Luke Sewell" catchers mitt with box sold for $160. A great looking mitt! 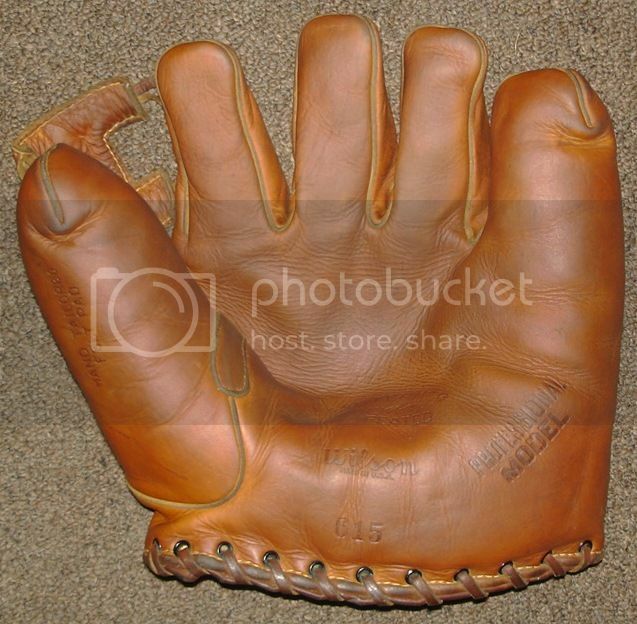 A 1920's sewn web Goldsmith model 73 glove sold for $131. A mid-line model but leather seems in good shape with strong markings on the front and a great cloth patch. An early Sewn web buckle back glove sold for $1000. It is a good size white leather model in good condition. It has a quirky feature of the first finger stall divided into three sections on the back. The seams are all welted and the rolled leather piping would indicate a pretty high quality glove. I would be curious if the new owner can detect a mfg. logo on the face. Anyway, a strong price and I'm sure leading up to the National that Brett & Co. are pretty jacked! Some other ones to catch up on. Another sewn web buckle back glove sold for $1314. This one has a crescent pad front. It is in decent shape. A Reach Babe Ruth "Home Run Special" catchers mitt and picture box sold for $3884. The mit and box are in nice shape. A barn fresh find, this super Stall & Dean "Stuffy McInnis" buckle web/back base mitt. it has to be one of the nicest found to date. it sold for $595, another strong price for a great looking mitt! A rare Winchester buckle web base mitt sold for $395. Pretty stylish and an unusual leather buckle strap keeper on the thumb. Pretty cool! A 1920's Rawlings model 14OL catchers mitt sold for $153. A mid line model but in fantastic condition. Great old style patch and multicolored leather. That buckle back full web and the Stall & Dean were great gloves - it was nice to see them do well. Not sure we have anything that nice for the National but stop by anyway. mikesglove wrote: A NOS Reach model 32 catchers mitt with hang tag sold for $250. Edit: Ah hell, they're all amazing..great post. I see I am not the only one with great taste. Last edited by demian1 on August 29th, 2014, 3:10 am, edited 1 time in total. mikesglove wrote: A 1920's sewn web Goldsmith model 73 glove sold for $131. A mid-line model but leather seems in good shape with strong markings on the front and a great cloth patch.